The world already has three fewer Dodge Demons. 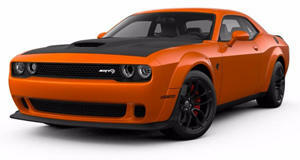 The Dodge Demon is definitely not a car for the faint of heart. In the initial hype surrounding the Demon’s release, reports kept pouring out about how the that it was actually cool. Not only do Demon owners have to before taking delivery, the car was actually so fast that it was . The Demon will be a very rare vehicle, each wearing a special plaque with the build number and owner’s name, in order to the car. But a recent event has just made the Demon even rarer. A handful of images emerged on a of three Dodge Demons that burned down in the back of a delivery truck. One of the cars was completely consumed by the fire, and the other two look to be seriously effected as well. The only good piece of the story is that the driver of the truck was not injured during the incident. The trailer on the truck, which belongs to Reliable Carriers, Inc., was also severely damaged. The fire reportedly occurred in Michigan, though it is unknown where the cars were headed. A man named Adam Harrod, who claimed to work for the transport company, said that there was an electrical issue with one of the cars, and that Dodge would cover the damages to the trailer. Reliable Carriers responded on the forum with a statement to dismiss this information. "Reliable Carriers, Inc. would like to clarify that “Adam Harrod” is not employed at our company, nor has he ever been previously employed by us. The individual has been ed by our attorneys. We have no other comments on the situation at this time. Thank you for your understanding" the post read. We’ll have to wait for an official statement, but if there is an electrical issue Dodge will have to take a look at the other cars before deliveries begin.